There is good reason to believe that in the 11th century it was not uncommon to employ these to record the deed of the living and to provide a souvenir for subsequent generations. Tapestries do not last for ever - Regimental colours which were made in a similar way, had to be replaced every century so a tapestry that was taken out regularly would last a similar time. 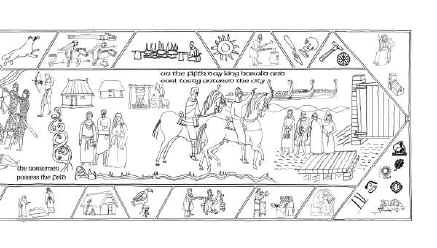 The survival of the Bayeux tapestry is exceptional. The Liber Eliensis (Book of Ely) records that Brythnoth's widow gave the Cathedral a tapestry or hanging celebrating his deeds. We do not have any record of the content so we do not know if it depicts the battle of Maldon. This was apparently given very soon after his death. If so, it had probably previously been prepared earlier and used to decorate his hall on fest days. Byrhtnoth was married to Ælfflæd, sister of Dowager Queen Edith , and thus a kinsman of King Edgar by marriage.